Ensure that waking with your dog is pleasure rather than endurance by teaching if from an early age to walk to heel. 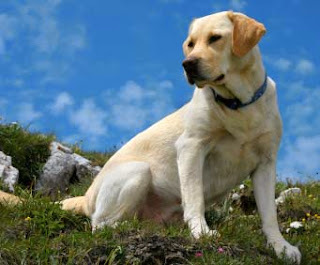 Labrador puppies enjoy human companionship so much that you can begin training without a lead. Then move on to lead work, gradually increasing the distance covered. 1. Kneel to the right of your alert, seated puppy. Holdings its collar with your left hand, speak its name and show it a favorite treat in your other hand. 2. Using the scent of the food to attract the puppy, walk in a straight line while giving the command “Heel”. Be ready to grasp the collar with your left hand if the puppy wanders. When you stop walking command “Wait”. 3. Keeping the treat low to prevent jumping, bend your knees and turn right, drawing the food round as you move. Repeat the command “Heel”. Your puppy will speed up to walk round you. 4. Left turns are more difficult. Hold the collar with your left hand and command “Steady”. Place the treat near your dog’s mouth then move it to the left. The puppy will follow. 1. With the puppy on a long training lead and seated to your left, hold the lead and a food treat in your right hand, and pick up the slack of the lead with your left. Tell your puppy to sit. 2. Move forwards on your left foot while giving the command “Heel”. If your puppy walks too far ahead, give the lead a light jerk. 3. With the puppy beside you in the heel position, offer it the reward and say “Good dog”. Repeat “Sit” and praise it when it obeys. 4. After the dog has learned to walk to heel in a straight line, teach it to turn to the right by guiding it with the treat. If your puppy has lost interest, postpone further practice until later. 5. Once the right turn has been learned, commence left – turn training. Hold the treat in front of the puppy’s nose to slow it down while speeding up your own circling movement to the left. Keep the puppy close and command “Steady” as it follows you round.